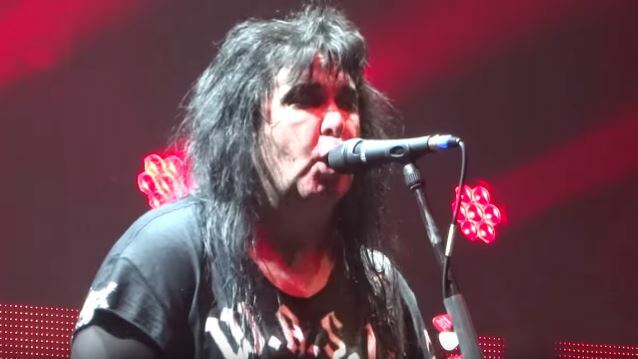 Fan-filmed video footage of W.A.S.P. performing a new song, "Last Runaway", on September 25 at Turbinenhalle in Oberhausen, Germany can be seen below. W.A.S.P. 's new album, "Golgotha", will be released on October 2 via Austria's Napalm Records. W.A.S.P. frontman Blackie Lawless previously stated about the making of the "Golgotha" CD: "The rehearsals for this album started in the spring of 2011. A lot of time was spent just talking about the direction of the songs and really trying to turn the songs inside out to see exactly where they wanted to go. "One thing you learn over the years in the songwriting process is that after the songs begin to take shape, they will eventually start to talk back to you and they will tell you where they wanna go. The trick is learning to listen when they speak. "This process of writing and arranging and the demos went on for several months before we even began to record the album for real. "One of the first tracks we recorded was 'Miss You'. It's interesting because, ironically, it was the first song ever written for [1992's] 'The Crimson Idol' [album]. "There were three songs that were originally supposed to be on the 'Idol' [CD] but never made it and 'Miss You' was one of them. When you see the lyrics, you'll understand that Jonathan is clearly talking to his brother Michael, as he kneels at his graveside." Regarding the song "Last Runaway", Lawless said: "Forty years ago I came to Hollywood as a teenager. Terrified and scared out of my mind, I had no idea what waited there for me. The song 'Last Runaway' is an intensely personal account of what happened to me, not only then but over the years and the success that followed after. Be it a kid looking for success in the music business or any life-challenging endeavor that someone would 'run away' from in life, I'm certain that everyone can relate to this story one way or another. It's another kid 'chasing the dream' and trying to survive it in the process. We've all been there." At the 2014 edition of the Sweden Rock Festival in Sölvesborg, Sweden, Lawless stated about the lyrical inspiration for the new W.A.S.P. CD: "'Golgotha' is Hebrew for place of the skull, and it's the hill where Christ was crucified. And it's interesting, when you see a lot of bands going around using Satanic images or images of death and things like that, and I'm thinking, all they need to do is look at the source, 'cause it's right there. I mean, if you want death, there's enough to go around there." Drummer Mike Dupke recently left W.A.S.P. after a nine-year stint with the band. He has since been replaced on the road by YNGWIE MALMSTEEN drummer Patrick Johansson and, more recently, by Randy Black (PRIMAL FEAR).